End Cottage in Tibthorpe, near Driffield , Yorkshire sleeps 4 people. End Cottage near Driffield is the very last cottage at the end of a lane, in the beautiful Wolds village of Tibthorpe. There is no passing traffic and with views across the Yorkshire Wolds; this tranquil, renovated, period cottage, adjacent to the owner’s home, offers excellent levels of accommodation and guest comfort. Every effort has been made to ensure that all guests expectations will be met and that all visitors will return home with great memories and wishing to return. Upon entering the cottage there is 1 step down into a small entrance hall. Leading off from this is a large sitting room with a traditional multi-fuel burner. This room is flooded with natural light from windows in the roof and has views across the garden and access into the conservatory, which then leads out into the enclosed garden. 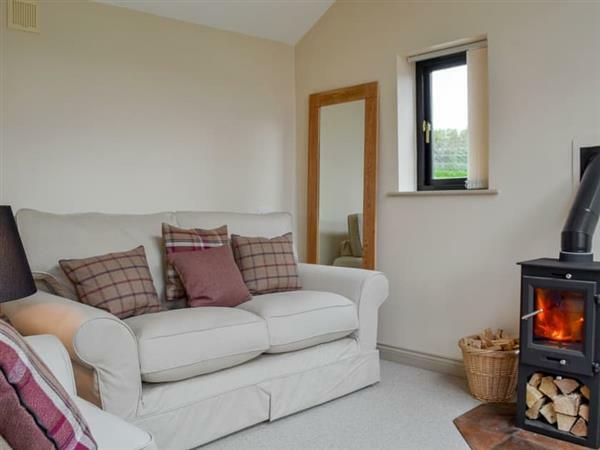 With deep sofas and a large flatscreen TV, this really is the perfect location to relax and unwind in front of the fire after a long day exploring the local area. The large modern kitchen/dining room has all the facilities the chef in the family would need to help prepare delicious home cooked meals. There is also access to the conservatory from the kitchen. Also on the ground floor is a bedroom with a zip and link bed, a wonderful full length feature window overlooking the garden, and an en-suite bathroom. The first floor is uniquely planned with a spacious mezzanine area at the top of the stairs with lots of books, as well as a day bed. This library area will enthral those who enjoy reading and relaxing whilst on holiday. There is a further bedroom with plenty of character with no two walls being the same! Nevertheless this room still manages to include an en-suite bathroom with a shower cubicle. The views are also pretty special too! The enclosed, dog friendly garden has a lovely summerhouse with a patio area, where you can sit and eat an early breakfast in the sun or enjoy al fresco dining after a day exploring the Yorkshire Wolds. The garage to the rear of the property is ideal for motorbike or cycle storage. If your interests are walking, cycling or birdwatching, or you just love the East Riding of Yorkshire, your every need will be well catered for in End Cottage. The beautiful Yorkshire coastline and the seaside town of Bridlington is only 17 miles away. The tower cliffs and RSPB reserve at Bempton Cliffs is also within easy reach. There is also easy access to York, Malton, Beverley and Hull (UK City of Culture 2017). The Yorkshire Wolds are dotted with picturesque villages and pretty market towns which can be explored from the miles of public footpaths, bridleways or from one of the many cycle routes. End Cottage really does have something for everyone. The beach is 17 miles from End Cottage near Driffield. With the shop, pub and restaurant 1½ miles from End Cottage. Living room: With multi-fuel burner, Freeview TV, DVD player and beams. Kitchen/dining room: With electric oven, electric hob, microwave, fridge/freezer, dishwasher, washing machine, tumble dryer and tiled floor. Bedroom 1: With zip and link super king-size bed (can be twin beds on request), Freeview TV and en-suite with shower over bath, and toilet. Seating area: Galleried with day bed (for flexible sleeping arrangements) and selection of books. Bedroom 2: With zip and link super king-size bed (can be twin beds on request), Freeview TV and en-suite with shower cubicle and toilet. Oil central heating, electricity, bed linen, towels, Wi-Fi and fuel for muliti-fuel burner included. Travel cot available on request. Welcome pack. Enclosed lawned garden with sitting-out area, garden furniture, summerhouse and barbecue. Bike store. Private parking for 3 cars. 2 small dogs welcome, to be kept on a lead at all times (sheep country). No smoking. Please note: The garden is sloping and has 2 steps in. Holidays at End Cottage run from Friday to Friday. Pets allowed at End Cottage. For a better idea of where End Cottage is, you can see End Cottage on the map below. End Cottage is in North Humberside; should you be on the lookout for a special offer, you can find all the special offers in North Humberside. It's always worth checking to see what is on offer at the moment. Do you want to holiday near End Cottage (UK10712), you can see other cottages within 25 miles of End Cottage; have a look to find your perfect holiday location.